Huntington Central Park has two restaurants; yet the one not to miss is Alice’s Breakfast in the Park; a unique bakery/ restaurant that puts the word “Old” in Old Fashion. Not too many people will recognize that Huntington Beach has a lake; yet for the fortunate, that have stumbled on to this treat, there has been many good times as return trips are a must. There is nothing like an early morning breakfast watching birds flying around Lake Huntington. Located on the West side of Huntington Central Park, Mary Beth and Alice Gustafson operate a restaurant / bakery and have mastered the cinnamon roll to the delight of their guests. The restaurant offers breakfast and lunch entrees served in their dining room that overlooks Lake Huntington or outside on tables lake side. Wildlife is everywhere and ducks swarm guests who have purchased food, which becomes entertainment of its own. Cinnamon Roll lovers will find that Mary Beth has mastered her craft take home baked goods make a great next day treat. The day we visited was Monday and we had breakfast. The staff was courteous, the wait was only 5 minutes, and the food was served fresh and hot. We started with May Beth’s famous Cinnamon Roll. We had the icing and nuts on the side and the roll was hot, sweet, and cinnamony good. We could not help but put in an order for rolls to go. I ordered the bacon and eggs and it was cooked to perfection. The bacon was thick and crisp there was no skimping, my plate had four pieces. The eggs were cooked to perfection and coupled with fresh fruit, it made a perfect meal. My favorite of this breakfast was homemade sour dough bread, toasted golden brown. I will have a problem ordering anything else when I visit again. My wife ordered the Denver Scrambled. It had nice fluffy eggs, tasty cubes of lightly smoked ham, fresh onions and bell peppers and was topped with a medium cheddar cheese. It was a great Denver Scrambled. 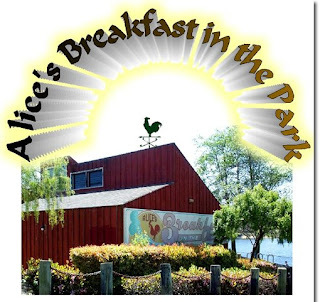 The joy of eating at Alice’s Breakfast in the Park is the nice walk through such a beautiful park after a sumptuous meal. Old oak trees line the lake and you can walk for miles through different landscapes and experience a wonderful small town atmosphere with friendly people. Huntington Central has a wildlife refuge, a Frisbee golf course, equestrian center, a dog park, library, work out stations, over 8 miles of walking trails and a sports complex. The facilities are well kept and it makes for a great day to experience whatever your outdoor fun is. Yet do not forget to stop into Alice’s for breakfast or lunch. I could not think of a better place to spend my morning and to ha ve breakfast with scenery makes this my #1 suggested restaurant in Southern California. 6622 Lakeview Drive in Huntington Beach. WEEKEND RESERVATIONS ARE A MUST! Welcome to Restaurant Reviews. My name is Louis Austad and I am currently seeking out restaurants to shine the light on. When I visit your restaurants expect a real review; I call it as I see it. To have your restaurant reviewed write me at Austad@ca.rr.com and we can set a date and time to visit your restaurant.